Updated Tuesday November 8, 2016 by RG. 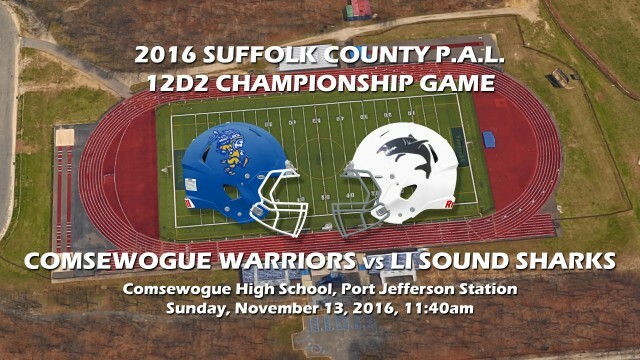 The 2016 Suffolk County P.A.L. 12D2 Championship Game. Our 8-0-1 Comsewogue Warriors hosts the 7-1-1 Long Island Sound Sharks. Comsewogue High School Turf Field. These two played to a 0-0 tie in Week One of the 2016 season. This time, there will be a victor - and the victor will be the 2016 12D2 Champions! !